I grew up on bake or roast bake as we call it.This was eaten more than fry bake. I guess this is a good thing because one should never eat too much fried foods. Roast bake on the other hand requires little or no oil or butter. 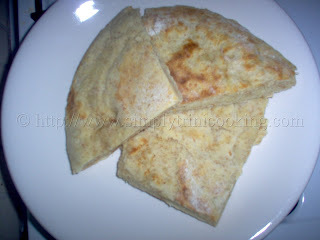 The bake could be made from plain flour or better yet with some wholewheat. 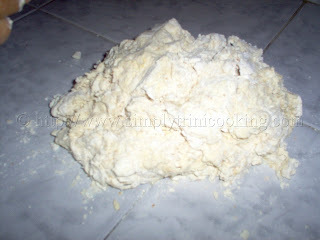 Lately, I have been adding some wholewheat to the flour and it has not compromised it taste or the texture. Roast bake, as its name implies, is a flat bread that is roasted on a tawah (platin or griddle) or in a heavy big iron pot on top of a stove. The bake is roasted on both sides. However, pay close attention to the bake roasting because it cooks quickly and you don’t want to burn it. Roast bake is no fuss to make because it can be eaten with butter, bologna, tuna, saltfish, cheese, vegetables (such as pumpkin, bodi, cabbage, baigan, and tomatoes). The vegetables could be steamed or curried or raw.Try tomato choka or baigan choka with roast bake and you will enjoy it! 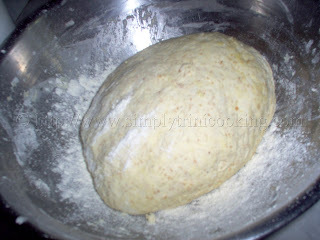 Rub in the fat and slowly mix enough water to make a smooth dough. 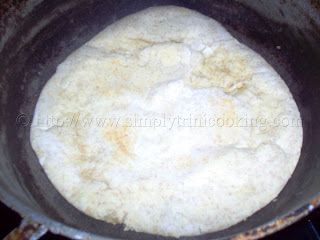 Cover with a damp cloth and allow the dough to rest for at least 30 minutes. 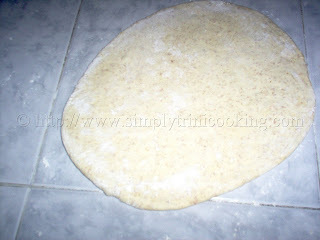 Roll each out on a floured board with a rolling pin to about a ½” thick. 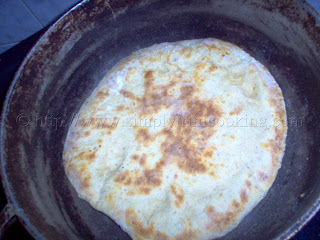 Cook in a hot deep heavy pot or baking stone (tawah) until it rises and is brown. Turn over to other side to cook. Place the bake on a clean cloth and cover. Serve hot with preferred filling. I always enjoy hot bake with a little butter; It’s a taste you just can’t beat! I bet this tasted as good as it looks. Always up for a new flat bread recipe. This looks great! We do something similar with a yeast dough in our book. 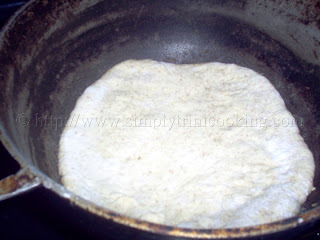 Felix, 2 questions – did you make this in your karahi and did you cover the pot at any point in time? UMMM! I don’t know what is a karahi. You’ll have to explain. is this dough supposed to raise at all in the 30 minutes rest period? i am int he process of making it right now, and i was so disappointed when i saw it remained the same size. i now know what i did… i forgot the sugar! lol. it came out small, but it was still edible. Ate it with some saltfish. thanks for this recipe. definitely worth perfecting on my part 😉 PS. Haven’t gotten around to either El Socorro or Port-of-Spain, but it is still on my to-do list. you don’t have to post up this comment, by the way..
Glad you got through Dora. That’s how you perfect something just try until you master it. Thanks for sharing! Hi! Great posts. Just wondering if this Roast Bake is the same as the Pot Bake I heard my grandparents used to make.